She was a stray at Daviess County Shelter in KY. Feists are small Southern hunting dogs descended from smooth Terriers brought to the region long ago by English miners. 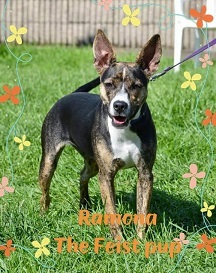 RAMONA is a 7 -10 month old puppy with ears & the agile ease of a bunny rabbit. She knows SIT, and should be good with kids and other dogs. Feists are smart, athletic, lovable and long-lived. They adore people….but not squirrels or rats. RAMONA has the makings of such a Feist & such a Family Dog. She is just about full grown. “Which word came first- “Feist” or “feisty”? This entry was posted in 6 to 12 Months, Adopted, Adopted Dogs, Dog Center, Female. Bookmark the permalink.